The sirtuins are a highly conserved family of nicotinamide adenine dinucleotide (NAD+)-dependent histone deacetylases, which are enzymes that regulate DNA expression. The sirtuin family helps regulate the lifespan of diverse organisms. The human genome encodes seven different sirtuins (SIRT1-7), which share a common catalytic core domain but possess distinct N- and C-terminal extensions. Dysfunction of some sirtuins have been associated with age-related diseases, such as cancer, type II diabetes, obesity-associated metabolic diseases, neurodegeneration, and cardiac aging, as well as the response to environmental stress. SIRT1 is one of the targets of resveratrol, a polyphenolic SIRT1 activator that has been shown to increase the lifespan and to protect various organs against aging. 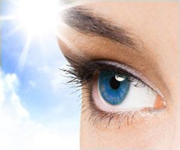 A number of animal studies have been conducted to examine the role of sirtuins in ocular aging. Here we review current knowledge about SIRT1 and ocular aging. The available data indicate that SIRT1 is localized in the nucleus and cytoplasm of cells forming all normal ocular structures, including the cornea, lens, iris, ciliary body, and retina. Upregulation of SIRT1 has been shown to have an important protective effect against various ocular diseases, such as cataract, retinal degeneration, optic neuritis, and uveitis, in animal models. These results suggest that SIRT1 may provide protection against diseases related to oxidative stress-induced ocular damage, including cataract, age-related macular degeneration, and optic nerve degeneration in glaucoma patients. Exp Eye Res. 2013 Nov;116:17-26. doi: 10.1016/j.exer.2013.07.017. Epub 2013 Jul 26. Mimura T1, Kaji Y, Noma H, Funatsu H, Okamoto S.
No free full text paper located at the time of publishing.